To order, please contact us with your order for epoxy and include address so we can determine appropriate shipping costs. Note, we can only ship epoxy to continental USA and Canada. We cannot ship to Alaska, Hawaii, or other countries. Super Sap CPM is a high temp cure, compression molding epoxy resin system that is designed specifically for the snow sports industry. Paired with Super Sap CPL hardener, this low viscosity two part epoxy system is an essential element in the design of your own custom skis and snowboards. The product features an easy to use 2:1 by volume mix ratio. When used with Super Sap CPL low viscosity hardener, the CPM system mixes and wets out your fiber composites easily. It features high adhesion to ensure a strong bond between common ski and snowboard building materials. Intended for use in a heated press with a target cure temperature of 180F, CPM system offers quick cycle times for high throughput production. Whether you are ski or snowboard manufacturer or learning how to make a snowboard or pair of skis for the first time, Super Sap CPM has you covered. 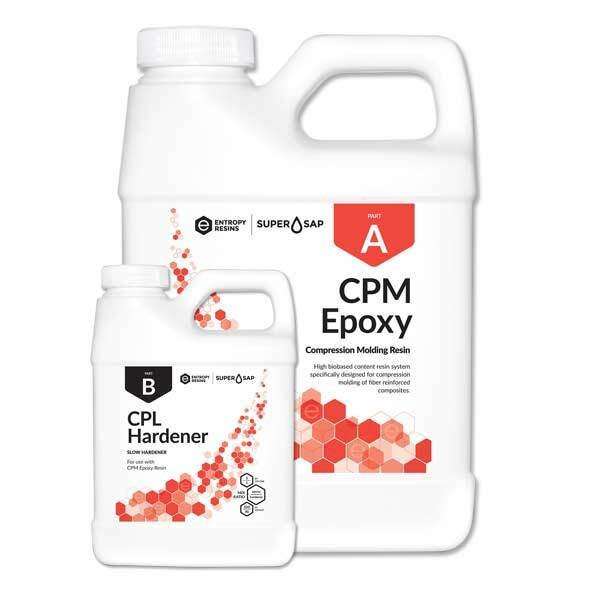 Manufactured by Entropy Resins, the makers of Super Sap performance, sustainable epoxies, Super Sap CPM is derived from 28-31% biobased, renewable sources making it one of the highest biobased epoxies on the market today. Additionally 1% of all Entropy Resins sales are donated to support non-profits making a positive environmental change through our participation in 1% For the Planet.